(Nanowerk News) In a promising lithium-based battery, the formation of a highly conductive silver matrix transforms a material otherwise plagued by low conductivity. To optimize these multi-metallic batteries--and enhance the flow of electricity--scientists needed a way to see where, when, and how these silver, nanoscale "bridges" emerge. Now, researchers from the U.S. Department of Energy's Brookhaven National Laboratory and Stony Brook University have used x-rays to map this changing atomic architecture and revealed its link to the battery's rate of discharge. The study--published online Jan. 8, 2015, in the journal Science ("In situ visualization of Li/Ag2VP2O8 batteries revealing rate-dependent discharge mechanism")--shows that a slow discharge rate early in the battery's life creates a more uniform and expansive conductive network, suggesting new design approaches and optimization techniques. "Armed with this insight into battery cathode discharge processes, we can target new materials designed to address critical battery issues associated with power and efficiency," said study coauthor Esther Takeuchi, a SUNY Distinguished Professor at Stony Brook University and Chief Scientist in Brookhaven Lab's Basic Energy Sciences Directorate. The scientists used bright x-ray beams at Brookhaven Lab's National Synchrotron Light Source (NSLS)--a DOE Office of Science user facility--to probe lithium batteries with silver vanadium diphosphate (Ag2VP2O8) electrodes. This promising cathode material, which may be useful in implantable medical devices, exhibits the high stability, high voltage, and spontaneous matrix formation central to the research. "The experimental work--in particular the in-situ x-ray diffraction in batteries totally encased in stainless steel--should prove useful for industry as it can penetrate prototype and production-level batteries to track their structural evolution during operation," Takeuchi said. 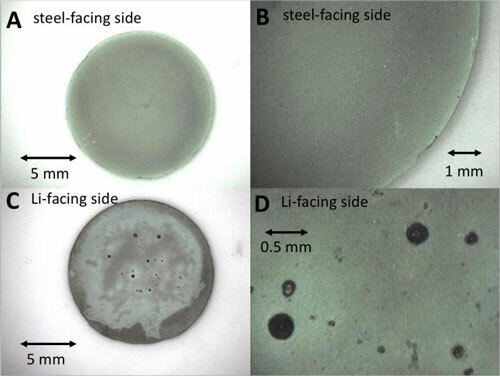 As these single-use batteries--synthesized and assembled by Stony Brook graduate student David Bock--discharge, the lithium ions stored in the anode travel to the cathode, displacing silver ions along the way. The displaced silver then combines with free electrons and unused cathode material to form the conductive silver metal matrix, acting as a conduit for the otherwise impeded electron flow. "To visualize the cathode processes within the battery and watch the silver network take shape, we needed a very precise system with high-intensity x-rays capable of penetrating a steel battery casing," said study coauthor and Stony Brook University Research Associate Professor Amy Marschilok. "So we turned to NSLS." Energy dispersive x-ray diffraction (EDXRD) at NSLS provided this real-time--in situ--visualization data. In EDXRD, intense beams of x-rays passed through the sample, losing energy as the battery structure bent the beams. Each set of detected beam angles, like time-lapse images, revealed the shifting chemistry as a function of battery discharge. "The silver forms in particles spanning less than 10 nanometers, and the diffraction patterns can be both dense and faint," said Brookhaven Lab scientist Zhong Zhong, who performed the critical alignment for the x-ray experiments at NSLS. Once the data was collected, Brookhaven Lab postdoctoral researcher and study coauthor Kevin Kirshenbaum led the data analysis effort. "This kind of analysis and interpretation requires considerable time and expertise, but the results can be stunning," Kirshenbaum said. In most batteries, the speed of lithium-ion diffusion determines the rate of discharge, a key factor in overall performance and efficiency. The material closest to the lithium anode would ordinarily discharge first, as the ions have a shorter distance to travel. In a surprising discovery, the researchers found that the material farthest from the anode and nearest the coin cell surface discharged first in the battery. "This is because the non-discharged cathode material is a very poor electric conductor, so the resistance for lithium ion diffusion is less than for electron flow," said coauthor and SUNY Distinguished Teaching Professor Kenneth Takeuchi. "This highlights a uniquely efficient aspect of in situ silver matrix formation: The silver matrix forms primarily where needed, which is more efficient than using conductive additives." The in situ diffraction data was combined with two techniques applied after operation: x-ray absorption spectroscopy (XAS) and angle-resolved x-ray diffraction (XRD). Spectroscopy can reveal exact chemistry because each element absorbs and emits light uniquely, but the x-rays used for XAS cannot penetrate the battery casing. So after each step in the discharge, the researchers removed the cathode and ground it into a powder to measure the average elemental composition. Chia-Ying Lee of the University at Buffalo prepared the reduced cathode materials for the initial ex situ measurements. "These techniques provide complementary data: the in situ diffraction shows where the silver is formed within the cathode, while the spectroscopy shows more precisely how much silver was formed," Esther Takeuchi said. NSLS ended its 32-year experimental run in September 2014, but its powerful successor is already taking data at Brookhaven Lab. The National Synchrotron Light Source II (NSLS-II) provides beams 10,000 times brighter than NSLS, and in situ energy research is a major part of its mission. NSLS-II, also a DOE Office of Science User Facility, will soon welcome users from industry, academia, and other national labs. "We are currently working on other materials that form conductive networks and hope to study them as functioning cells," Takeuchi said. "The brighter beams and greater spatial resolution of NSLS-II will be a great tool in studying other cathodes and pushing this technology forward."